1 Dk Blue TPT Stretford-Chorlton (Hawthorn Lane then Chorlton Brook) Following feasibility investigation works this section falls within our Sale Water Park Proposals Scheme 2 & 3. It is our recommendation that this is the preferred route. Including the section marked as A on plan. We have recommended this is the preferred route as opposed to along the northern embankment of River Mersey. 4 RedBox Slope on Trafford side of Jacksons bridge Ramp options have been developed. 5 BoldPink Dane-Hawthorn (Priory-SWP-M32) The proposed route is along the existing path with car park facility. This is included within our Dane Road Access & scheme No: 1 & Bridgewater Canal Scheme No: 4. 6 RedLine Hardy-Rifle (+Jacksons Bridge widening) Bridge options are being considered. Hardy – Rifle Road is outside the current scheme scope. 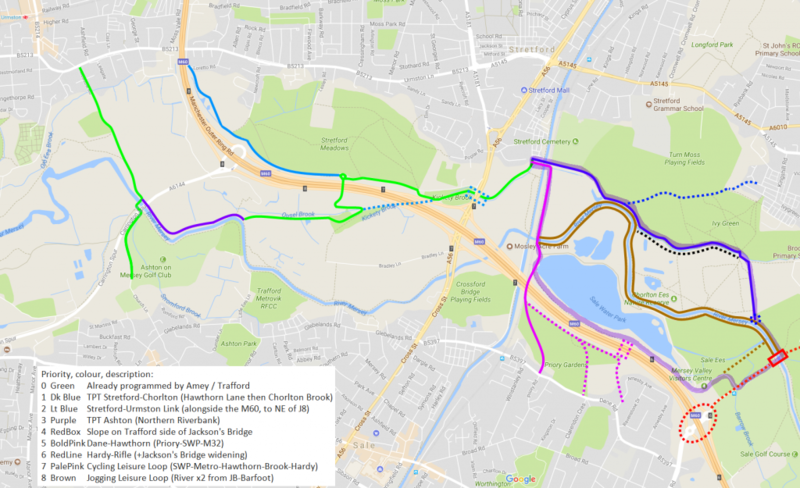 7 PalePink Cycling Leisure Loop (SWP-Metro-Hawthorn-Brook-Hardy) Not within our current scheme scope. 8 Brown Jogging Leisure Loop (River x2 from JB-Barfoot) Part of our Mersey Sale Water Park Scheme No.s 6 & 7. However, please note the northern section shown as B will not exist as we are re-routing along section shown as A on plan. This following consultations with EA confirming that section is prone to flooding and the existing narrow embankment would require significant alteration works to make a suitable facility. In addition the egress from the bank would be difficult as it is within close proximity to a weir. We have requested drawings for these proposed schemes and will circulate if/when they arrive.